Do a web search for "sustainable development" and you get millions of hits. Everyone wants sustainability; green is the new black. The word is so overused it means everything and nothing. In 1987 the United Nations said sustainable development "meets the needs of the present without compromising the ability of future generations to meet their own needs." But in recent years, greenwashing has made the term ubiquitous — and suspect. Assessing Sustainability tackles two of the biggest questions facing planners today: What is sustainable development, and how do we know when it's working? Does it benefit the environment? Build community equity? Boost the economy? 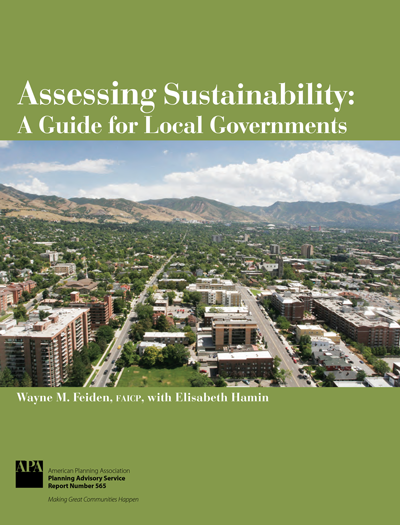 This report strips away the rhetoric to show how local communities can benchmark sustainability and make it a measurable goal.